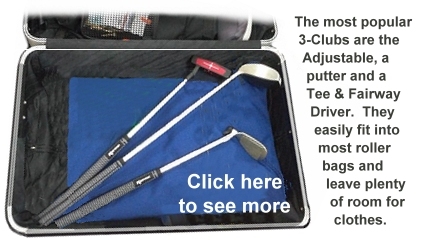 The Whole-In-One Adjustable club is the most "unlike" a putter which is the shortest, heaviest, and most dedicated club. Putters come in all kinds of shapes and weights. The Divnick Adjustable club has 4 putter lofts and alignment sight lines, but you have to choke down on the shaft to replicate the stroke. Some people adapt to it easily, others have a harder time. For those who want a more traditional putter feel, but still want portability, we offer some basic putter head styles and lengths on telescoipc shafts, or with one-piece shafts for those who aren't concerned with portability. Standard putter length is 35 inches/89cm in length. You can order other lengths for a $20 additional charge. They collapse to approximately 21.5 inches/54.6cm, depending on the model and hosel length. All our standard-length putters are fitted with telescopic shafts that collapse to the shortest possible length. When you place your order, you can select from the following heads. Or let us know if you want a different style or if you want to send us your head. Even though the USGA recently adopted the rule that you can't anchor your putter against your body, our telescopic long chest putters are still very popular. Many people are using them like Bernard Langer without anchoring the top hand. Click here to read about our telescopic long chest putters. Non-Telescopic: If you don't want the telescopic shaft, there is a $20 reduction in prices listed below. This beautiful head features an offset shaft alignment, soft precision-milled anodized alloy inserts for a striking look, superior performance, and the ability to scoop the ball off the ground. The body has a beautiful tin-nickel finish. At 310 grams (72º lie) , it is the lightest of our putter heads. It collapses for storage or travel to 20.5 inches (52cm). The normal price for this telescopic putter is $149. If ordered before the end of April the cost is $129 for telescopic plus an additional 10% discount if you order 3 or more clubs. Right or Left-Handed. Non-telescopic shafts are $20 less. The red mallet-shaped head features an offset shaft alignment, a low center of gravity, and the ability to scoop the ball off the ground. The body has a beautiful tin-nickel finish. At 335 grams (72º lie), it provides solid smooth putts. It collapses for storage or travel to 20 inches (50.8 cm). The normal price for this telescopic putter is also $149. If ordered before the end of April the cost is $129 for telescopic plus an additional 10% discount if you order 3 or more clubs. This Pole-Kat head was originally designed for chest putters, but it also makes a fantastic heavy putter at 475 grams with a traditional length and stance. Ball-contact is amazingly solid and controlled. This head is especially unique because it has a more upright lie angle so you can set up with the head closer to your feet and more directly under your eyes for a steadier pendulum stroke. This is the most popular putter choice. "I can't believe how solid and straight I putt with this heavy putter. I'm sinking putts from all lengths now. I can't tell whether it is because of the weight or the fact that my eyes are ball. Either way, I'm saving strokes. Love it!" With its square design, and straight lines, it is very easy to line up and keep lined up throughout the putt. It provides great balance, superb feel, and ultra-high MOI. The normal price for the Telescopic Heavy Putter is $169. If ordered before the end of April the cost is $149 for telescopic plus an additional 10% discount if you order 3 or more clubs. Non-telescopic shafts are $20 less. We have an optional head cover for this head for $15 pictured to the right. Left Handed? Click here to see the heavy head option for lefties. If you prefer a different head style, we can build a telescopic shaft for it. Just let us know what you are looking for. Telescopic Shaft on Your Head? Do you have a head you like? You can send it to us and we will install a telescopic shaft on it. If it uses a curved shaft, it requires a different option described here. Click here to read more about telescopic shafts on your head. Shipping: Shipping options will be shown to you on our secure order form before you confirm your order. It is usually between $12 and $16 for Fedex Ground in the Continental United States depending on your location, and about $18 to Alaska and Hawaii. We charge shipping only on the first club, and we pay the shipping on all additional clubs! International: If your address is international, we will send you the shipping options before we process your credit card. Tracking: You will receive an email tracking link directly from the Fedex server, unless it gets blocked by your spam-filter which sometimes happens with automated emails. Call: If you prefer to order by phone or have any questions, please contact us. If you are interested in long chest putters, click here.